Jmol is an open-source Java viewer for chemical structures in 3D, that does not require 3D acceleration plugins. Jmol returns a 3D representation of a molecule that may be used as a teaching tool, or for research e.g. in chemistry and biochemistry. It is free and open source software, written in Java and so it runs on Windows, Mac OS X, Linux and Unix systems. There is a standalone application and a development tool kit that can be integrated into other Java applications, such as Bioclipse and Taverna. A popular feature is an applet that can be integrated into web pages to display molecules in a variety of ways. For example, molecules can be displayed as "ball and stick" models, "space filling" models, "ribbon" models, etc. Jmol supports a wide range of molecular file formats, including Protein Data Bank (pdb), Crystallographic Information File (cif), MDL Molfile (mol), and Chemical Markup Language (CML). The Jmol applet, among other capabilities, offers an alternative to the Chime plugin, which is no longer under active development. While Jmol has many features that are not available in Chime, it does not claim to reproduce all Chime functionality (most notably, Chime's Sculpt mode). Chime requires plug-in installation and Internet Explorer 6.0 or Firefox 2.0 on Microsoft Windows, or Netscape Communicator 4.8 on the MacintoshOS9. Jmol requires Java installation and operates on a wide variety of platforms. For example, Jmol is fully functional in Mozilla Firefox, Internet Explorer, Opera, Google Chrome and Safari. Willighagen, Egon; Howard, Miguel (June 2007). 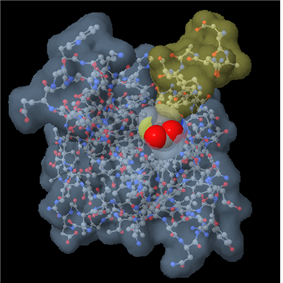 "Fast and Scriptable Molecular Graphics in Web Browsers without Java3D".